Dubai is awake again. Whilst it's still not to the Dubai I knew before the recession, there are plenty of positive signs. 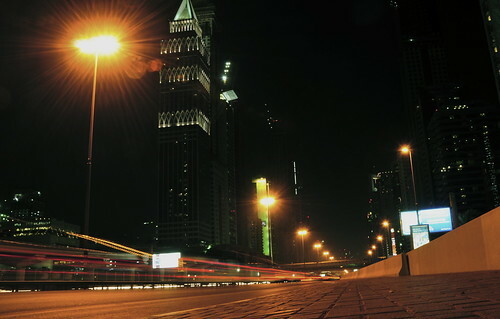 I used the Sheikh Zayed road to measure the activity level on a previous trip. This time I was actually stuck in traffic on a few occasions. There are still unfinished buildings with no obvious signs of any work in progress; but roads, shops and restaurants are reasonably busy. With the summer heat, malls feel busier and I'm told hotels are taking more and more bookings for the summer. Work-wise, some of the projects previously on hold have been dusted off and are taking shape - even if only on paper. In all my meetings, I sensed a readiness to do business again. Do Gorillapods work with DSLR? Wouldn't they tilt forward with the weight of the lens? That's very good to hear! It's always good that businesses are slowly getting up on their feet again and trying to move forward! Many hotels and airlines are giving away great offers for stays in Dubai right now..
yes I think if you position the legs to balance the lens weight it might work. It seems indications that people are beginning to buy places again, not as much as before but places are surviving! That's a really nice long exposure.